David Gibson, born in 1804 in Scotland, immigrated to Lower Canada, where he became actively involved in the survey to establish the limit between Lower Canada and United States. In 1825 he came to Upper Canada where he was appointed Deputy Land Surveyor. In 1834, under the mayoral leadership of William Lyon MacKenzie, Gibson was appointed the first City Surveyor of Toronto. During these years he was twice elected to the Parliament of Upper Canada. 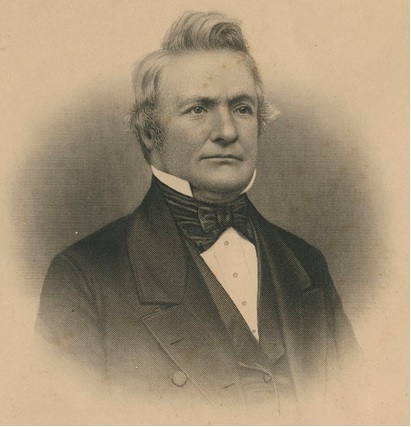 After his involvement in the unsuccessful Rebellion of 1837 he escaped to the United States, where he was appointed as an Engineer for the Erie Canal. Gibson was granted a pardon in 1848 and returned to Upper Canada to resume his survey practice in Willowdale and reside at the brick dwelling, now widely known as "The Gibson House", that he had constructed to replace the home burned by government forces. David Gibson passed away in 1864, leaving behind seven children, two of whom would become Land Surveyors: James Alexander (1831-1908) and Peter Silas (1837-1916). In his lifetime, David Gibson was instrumental to the development of Upper Canada and responsible for a survey heritage which exists to this day. Peter Silas Gibson, having graduated with a Masters Degree in Civil Engineering from the University of Michigan at Ann Arbor, would remain in Willowdale to continue the practice his father started. Commissioned in 1858, he became the Engineer for York Township and numerous other Municipalities. Peter became very involved with the Association of Provincial Land Surveyors. Appointed to the Board of Examiners in 1873, he served for twenty years. Peter was involved in the incorporation of the Association of Ontario Land Surveyors in 1892 and became President in 1898. He was also noted for his commitment to education, articling many noteworthy Surveyors, including A.J. Van Nostrand. When Peter died he left 10 children, 3 of whom became Ontario Land Surveyors: Harold H. Gibson, Wilbert Silas Gibson and Morton Milne Gibson. Wilbert Silas Gibson, born in 1878, was commissioned as an Ontario Land Surveyor in 1898 and continued to practice in Willowdale until he moved to Davisville in North Toronto. There with his sons S. Eldon Gibson (1906-1987) and Charles W. Gibson (b. 1916, now retired), the firm W.S. Gibson & Sons was ultimately established.